Summer scene at Kitsilano Beach, Vancouver B.C. 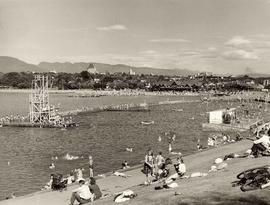 Photograph depicts a summer scene at Kitsilano Beach.Groups of adults and children sitting on the grass and swimming or canoeing in the water; dock with diving board in left of image; Burrard Bridge and Hotel Vancouver visible in background. 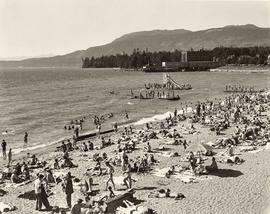 Photograph depicts the beach at English Bay.Crowds of people in bathing suits on the sane, with towels and parasols; people in water and on wharves in the water; tall brick structure and houses in background. Photograph depicts Second Beach at Stanley Park.Shore at low tide; man made rock swimming barriers jutting into water; white, two story house-like structure, probably serving as concession and rest area; benches along short, rock lined promenade. B&W print depicts Irving Snider (sitting front left) with friends at English Bay in front of the old bathhouse.